Thor week has one more day left in it here on IADW, so I wanted to make sure I got in a nod to the brilliant Thor run written by J. Michael Straczynski. Not only did JMS stick Asgard in small town America, he brought two seemingly opposite Avengers finally to blows. Set in the Marvel Civil War age, where Tony is running the S.H.I.E.L.D. Registration Act of all operating supers, Iron Man travels to Thor's new heartland home to bring him inline. As Thor remains silent to Tony's pleasantries at seeing him alive, Stark quickly gets "to the formalities". 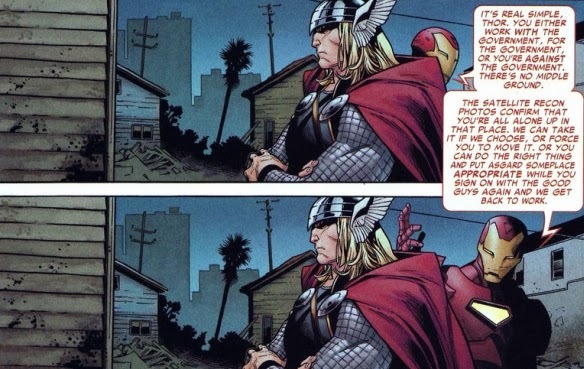 Thinking you can speak that way to a man carrying a hammer few can lift is one thing, but Iron Man follows up the ultimatum with a "So? What do you say?" You know what I say? 'Act like a douche bag, get treated like a douche bag'. 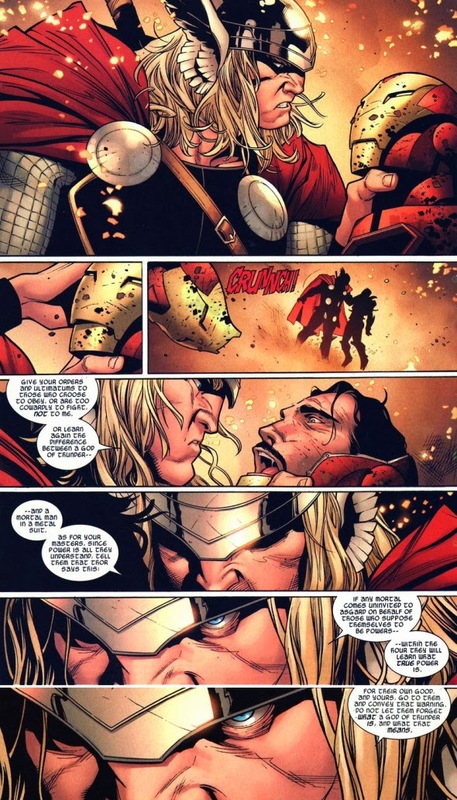 Fortunately for JMS's career, Thor's more eloquent than I. Click here to see his response (and more) on the next page. No matter how many times I read this, it makes me childishly giggle that talkative Tony gets hit for six like a cricket ball by a silent Thor, (albeit with an awesome 'Spaaaaang!' and a 'Krannng!'). Yup, when I get reincarnated I'm coming back as a comic sound-effect word maker-up-er-er. Just decided. 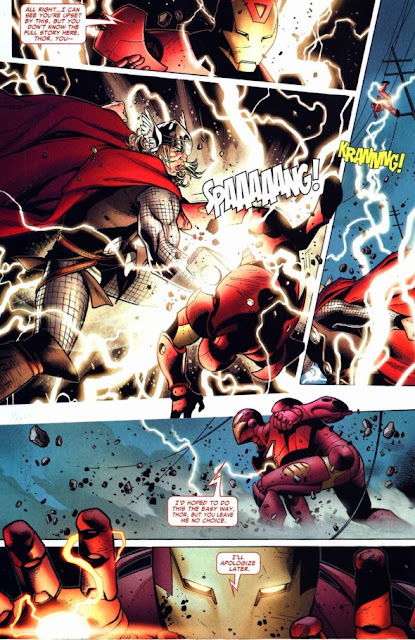 While Tony follows suit, unleashing all the power his gauntlets can muster, when the repulsor smoke clears, Thor is standing unharmed. As the supposedly 'Invincible Iron Man' swaps strategies, flying in for a physical confrontation, Thor takes the cricket analogy one step further and a recurring result is had (also with a 'Spanng!'). 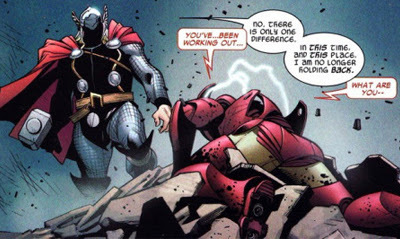 I love how Thor removes Tony's faceplate to get his message across. Olivier Coipel's art on this title truly was career defining stuff. The one glitch of the issue was that Thor declared himself neutral in the Civil War between Stark and Steve Rogers. That's harder to swallow, than if I were Tony with a giant Asgardian thumb pressing into my throat. 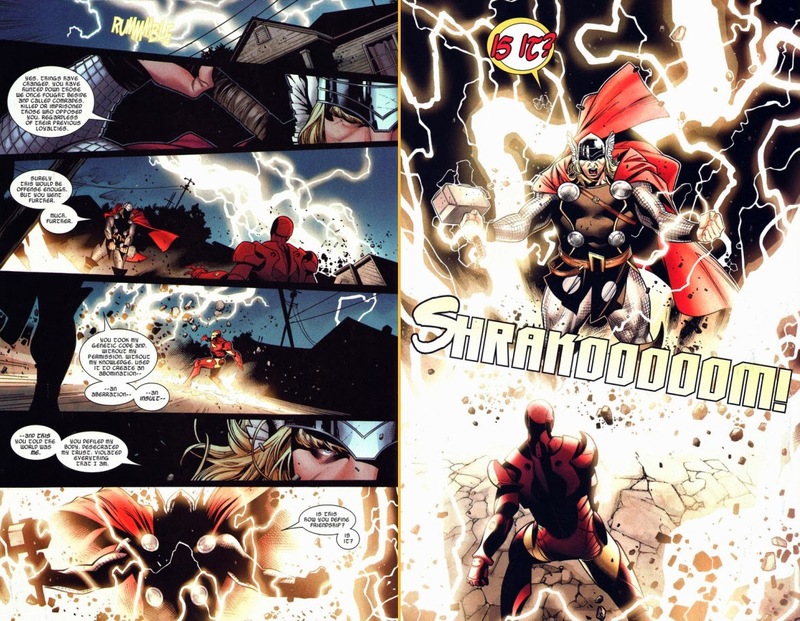 Thor's respect for the shield slinger would have the Odinson knock Tony around one more time for Cap's sake, especially as the registration started a chain of events which led to Captain America's 'death'. Oh well, he can always take him out back in some cosmic battle, 'bury the hatchet', then claim Thanos did it. Sure Tony may smell like a rotisserie chicken after and have hammer sized dings all over his 'shell', but if Thor says Thanos did it, Thanos did it okay? Sheesh!